As obvious as it sounds, staying warm and dry while snowboarding is one of the most important aspects of having an enjoyable experience. Regardless of which side of the baggy or skinny snowboard jacket you’re on, buying a snowboard jacket is all about picking one that’s functional. And while fashion can definitely impact your decision, looking good won’t keep you warm and comfortable, and being uncomfortable will impact your snowboarding ability. That being said, here are some key aspects to consider when shopping for womens and mens snowboard jackets. First and foremost, you have to decide whether you want an insulated or shell ski jacket. Insulated womens and mens snowboard jackets, as their name implies, are made with an insulating layer that’s built in the jacket itself. The outside is generally a windproof and waterproof shell, while the insulation is generally made of a synthetic material. The insulation is usually measured in grams, and more grams translates to more warmth. A general rule of thumb is – anything below 60 grams is lightly insulated and is decent for mild conditions, while anything above 100 grams is designed for extremely cold or windy weather conditions. 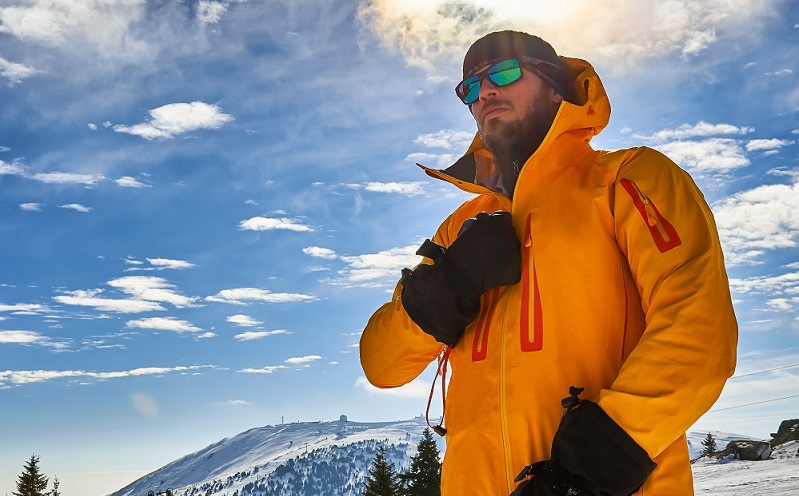 Shell ski jackets, on the other hand, allow for maximum mobility and are highly breathable due to the fact that they don’t include an insulation layer. Instead, they only feature a windproof and a waterproof shell. With these jackets, you want to have extra layers of clothing underneath to keep you warm, meaning, you can control your own body temperature. They are the preferred choice for mild weather conditions, so you shouldn’t rely on them to keep you warm in extremely cold and windy conditions. Regardless of which type you end up picking, it’s important to consider their waterproof and breathability features. Typically, retailers grade the breathability and waterproof ratings of their jackets on a scale from 1-10, but there are also some retailers that rate them based on millimetres for waterproofness and grams for breathability. Waterproof ratings usually range from 5.000 to 20.000mm. Generally, the higher the ratings are – the more expensive the jackets will be, but more often than not, they’re worth it. Similarly, the breathability ratings of the jacket are typically within the 5.000 to 15.000 range, and the higher the rating is the higher the price of the jacket will be.